The beautiful face-on spiral galaxy M101 in Ursa major is fantastically detailed but dim! It’s only 8th magnitude so it requires long exposures and relatively dark skies. The images below are composed of 7 x 12 minute (720 sec) and 2 x 6 minute (360 sec) exposures (total integration time = 94 minutes). 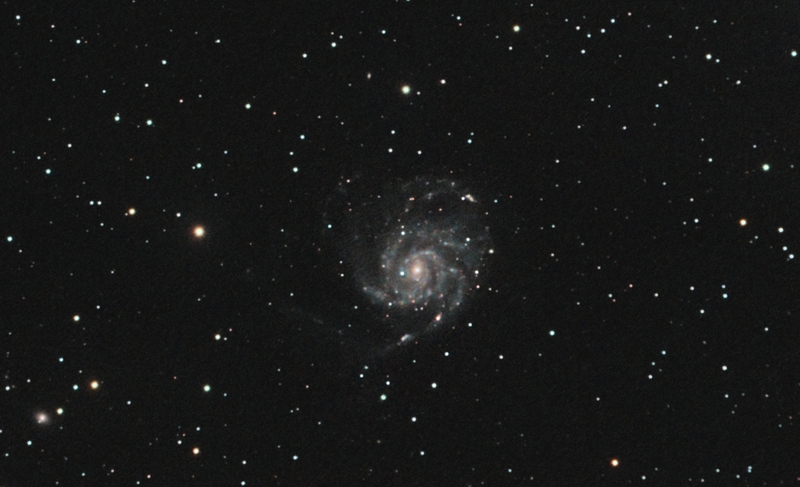 M101 has slightly eccentric spiral arms and has many bright nebulae (bright blue-white OB class star clusters and surrounding gas) and reddish HII regions. These features suggest that it has interacted with another galaxy gravitationally and is currently undergoing very active star formation. There are also several background galaxies in the full frame image as a large cluster of galaxies lies in the direction of Ursa major. Although Charles Messier’s assistant, Pierre Mechain was the first to catalogue M101, It was Lord Rosse in Ireland (with the 72 inch Leviathan telescope at Birr castle) who was the first to analyse and catalogue some of the subregions listed below. M101 was actually listed twice in the Messier catalogue as M101 and M102 in 1781 (Pierre’s mistake! Corrected in 1783) hence you will sometimes hear the Messier catalogue listed as either 110 or 109 objects. #11 – A bright blue dot just below the galaxy is NGC 5471 which was originally labelled as a “bright nebula” which is observationally correct but Hubble Space Telescope observations have revealed that the glow (pumped by X-ray radiation) is due to the remnants of 3 separate supernovae explosions – again consistent with “recent” intense star formation. NGC 5477 spiral galaxy (below M101). NGC 5474 irregular dwarf galaxy with PGC 4545422 galaxy overlying it (large nebulous area, below and to right of M101). NGC 5422 spiral galaxy (edge on – like a flying saucer, above and to left of M101). Close-up of M101 (click to enlarge). 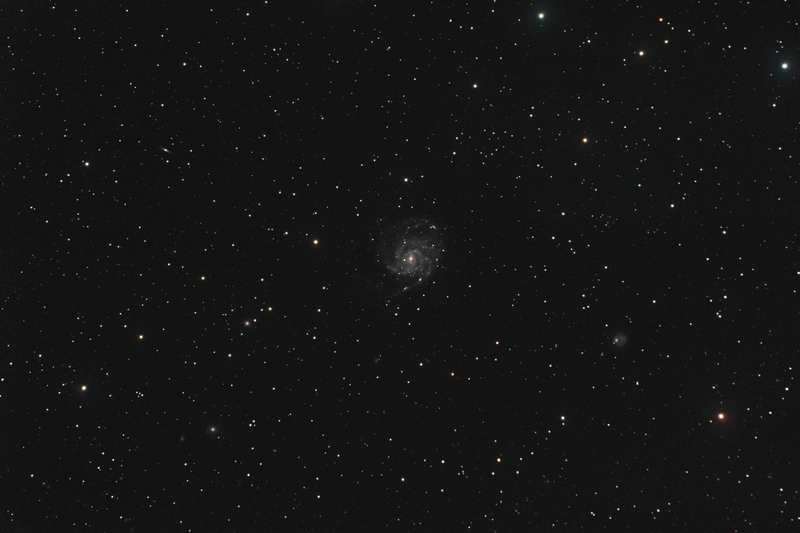 M101 wide-field view (click to enlarge). 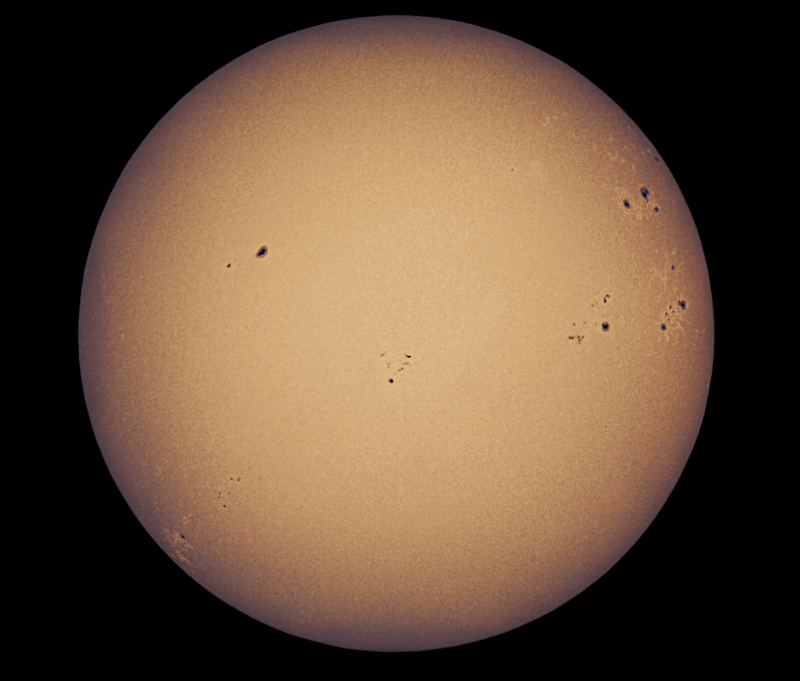 480/80mm f6 refractor.1.0 x field flattener. Ioptron ZEQ25GT mount. Guided with Orion SSAG/PHD. modified Canon 60D @ 800ISO with clip-in CLS filter. Acquired with BackyardEOS and post-processed in PixInsight 1.8 and Photoshop CS 3. PLEASE DO NOT OBSERVE THE SUN DIRECTLY WITH YOUR EYES OR ANY OTHER INSTRUMENT. PLEASE READ BELOW FOR ONE WAY TO SAFELY OBSERVE THE SUN! Nice weather for the last few days and it’s Sunny. So after fitting a safe solar filter, I took out the Nexstar 8SE and attached a Canon 5D mark II to the business end. ISO 100 and 1/500 sec exposure. 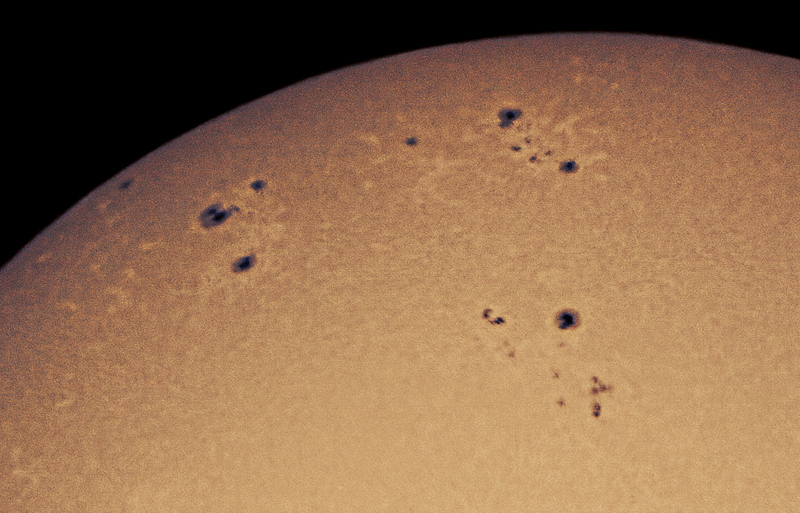 The sun is quite active at the moment. M53. A pretty globular cluster in Coma berenices set against a nice background of colourful stars. 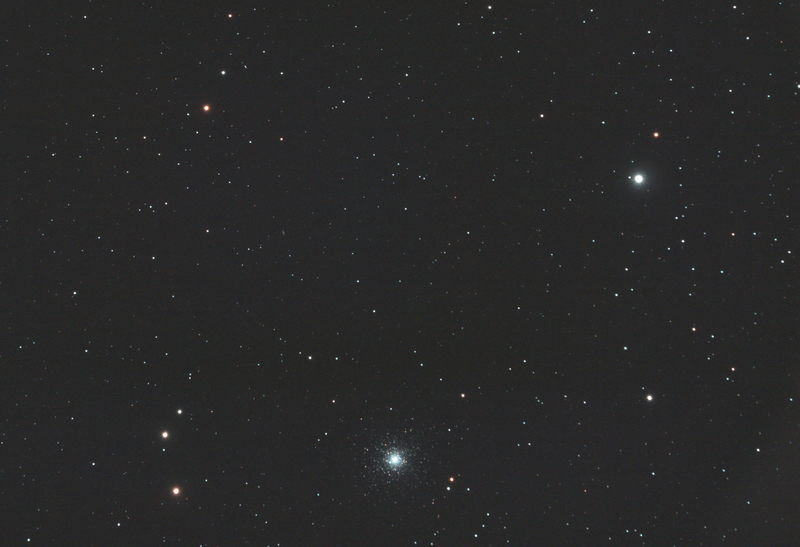 The bright star to the right is Diadem (with smaller binary companion). Spiral galaxy UGC 8248 is visible in full image size to the right and below the top group of 3 stars. 480/80mm f6 refractor.1.0 x field flattener. Ioptron ZEQ25GT mount. Guided with Orion SSAG/PHD. Canon 60Da @ 800ISO. Post-processed in PixInsight 1.8 and Photoshop CS3. Apart from Andromeda, most galaxies are quite small in terms of angular size. 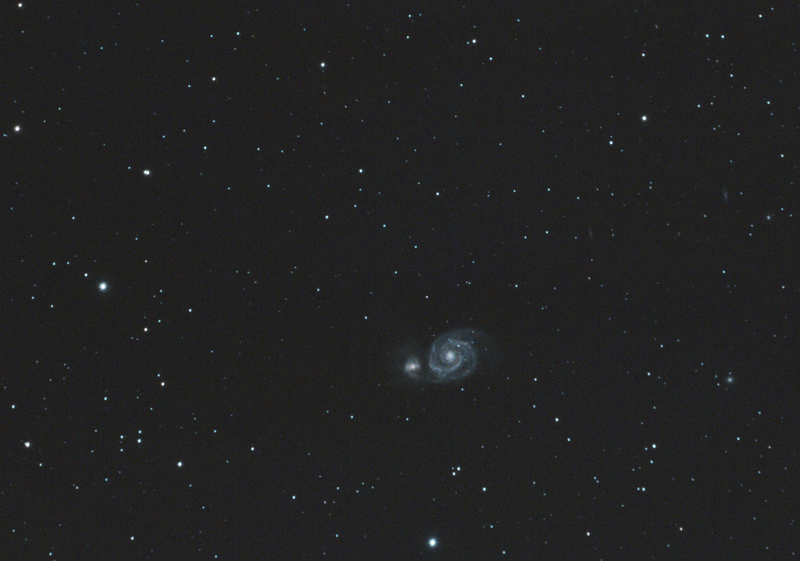 My 80mm refractor is quite a modest scope but I was keen to see what I could make of the Whirlpool galaxy M51 and its companion NGC 5195. The two are interacting gravitationally, with the larger M51 pulling material from the smaller NGC 5195. Some other galaxies are visible in the field of view. I think the 2 spirals to the NE (if N is at the top) are IC 4263 and NGC 5169. Small elliptical galaxy NGC 5173 is just beyond NGC 5169. Directly E of M51, the small fuzzy blob is the elliptical galaxy NGC 5198. Integration of 5 x 60 secs, 4 x 300 secs and 2 x 600 secs (45 minutes total). 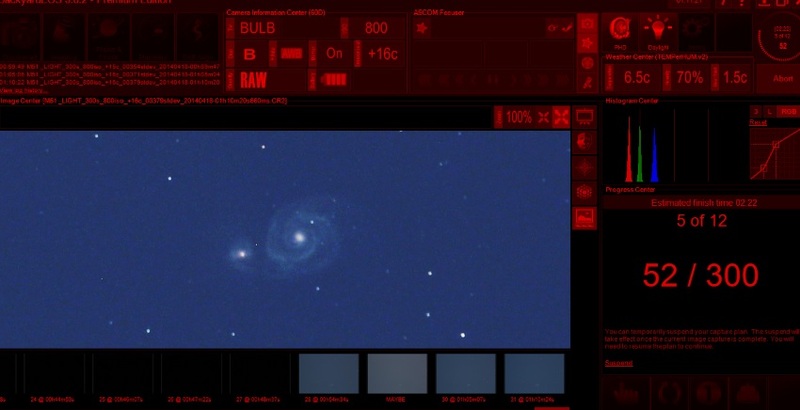 BackyardEOS is the program that controls the camera settings and acquisition. The screenshot tells me that I am shooting in bulb mode at ISO800. I am 52 seconds into a 300 second exposure. External temp is 6.5c, camera chip temp is 16c. There is 70% humidity and optics are above the atmospheric dew point of 1.5c. This is the 5th of 12 exposures that I have programmed and are currently being executed. The graph on the right shows that I have “stretched” the light histogram data upwards and to the left to better see the faint RAW image obtained from the camera. Full moon tonight, so I thought I would try something a bit different. 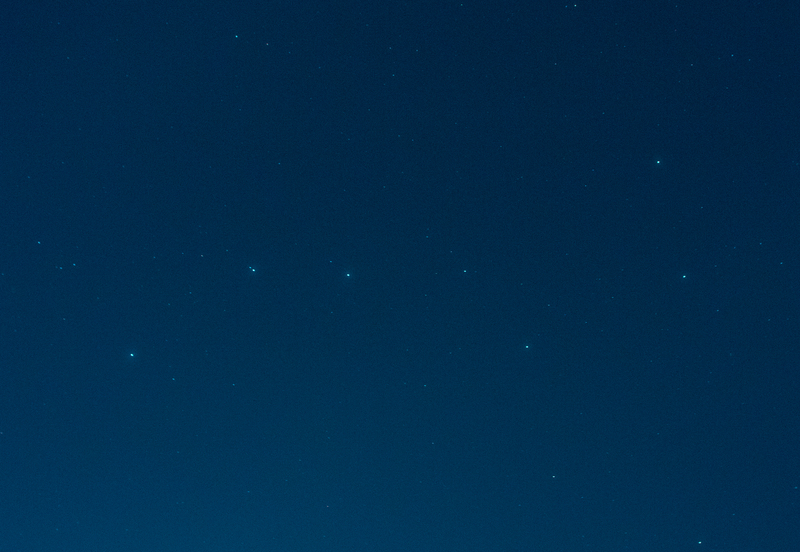 This is the Plough in Ursa Major. 25 second exposure at ISO 800, Canon 60Da on tripod with a 24mm f1.4L lens @ f4. Tiffen fog double 3 filter. Pictures were taken after midnight. You can see how bright the sky was! The full moon was to the bottom left. The Plough was at zenith…. 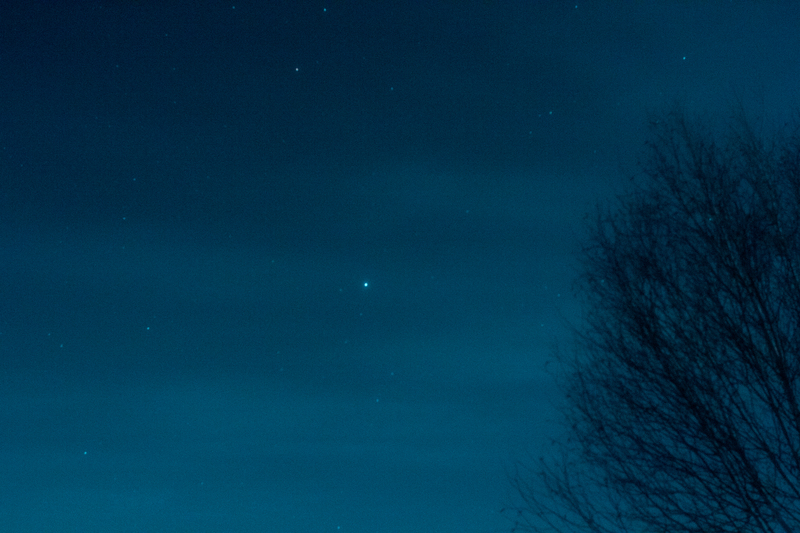 ….and to the Northeast, Vega!